Nuclear power in Germany accounted for 17.7% of national electricity supply in 2011, compared to 22.4% in 2010. German nuclear power began with research reactors in the 1950s and 1960s with the first commercial plant coming online in 1969. The anti-nuclear movement in Germany has a long history dating back to the early 1970s, when large demonstrations prevented the construction of a nuclear plant at Wyhl. In 1986, large parts of Germany were covered with radioactive contamination from the Chernobyl disaster and Germans went to great lengths to deal with the contamination. Nuclear power has been a topical political issue in recent decades, with continuing debates about when the technology should be phased out. The topic received renewed attention at the start of 2007 due to the political impact of the Russia-Belarus energy dispute and in 2011 after the Fukushima nuclear accident in Japan. Within days of the March 2011 Fukushima Daiichi nuclear disaster, large anti-nuclear protests occurred in Germany. Protests continued and, on 29 May 2011, Merkel's government announced that it would close all of its nuclear power plants by 2022. Eight of the seventeen operating reactors in Germany were permanently shut down following Fukushima. Chancellor Angela Merkel said the nuclear power phase-out, previously scheduled to go offline as late as 2036, would give Germany a competitive advantage in the renewable energy era, stating, "As the first big industrialized nation, we can achieve such a transformation toward efficient and renewable energies, with all the opportunities that brings for exports, developing new technologies and jobs". Merkel also pointed to Japan's "helplessness" – despite being an industrialized, technologically advanced nation – in the face of its nuclear disaster. In September 2011, German engineering giant Siemens announced a complete withdrawal from the nuclear industry, as a response to the Fukushima nuclear disaster. 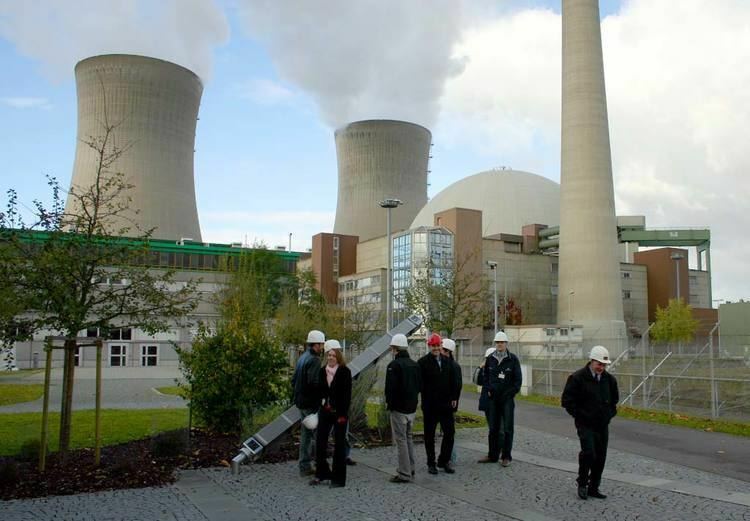 Remaining nuclear companies in Germany are E.ON Kernkraft GmbH, Vattenfall Europe Nuclear Energy GmbH, RWE Power AG, and EnBW Energie Baden-Wuerttemberg AG. German publications of the 1950s and 1960s contained criticism of some features of nuclear power including its safety. Nuclear waste disposal was widely recognized as a major problem, with concern publicly expressed as early as 1954. In 1964, one author went so far as to state "that the dangers and costs of the necessary final disposal of nuclear waste could possibly make it necessary to forego the development of nuclear energy". As in many industrialised countries, nuclear power in Germany was first developed in the late 1950s. Only a few experimental reactors went online before 1960, and an experimental nuclear power station in Kahl am Main opened in 1960. All of the German nuclear power plants that opened between 1960 and 1970 had a power output of less than 1,000 MW and have now all closed down. The first commercial nuclear power plant started operating in 1969. Obrigheim, the first grid station, operated until 2005. (Neckarwestheim.) A closed nuclear fuel cycle was planned, starting with mining operations in the Saarland and the Schwarzwald; uranium ore concentration, fuel rod filling production in Hanau; and reprocessing of the spent fuel in the never-built nuclear fuel reprocessing plant at Wackersdorf. The radioactive waste was intended to be stored in a deep geological repository, as part of the Gorleben long-term storage project. In the early 1960s there was a proposal to build a nuclear power station in West Berlin, but the project was dropped in 1962. Another attempt to site a reactor in a major city was made in 1967, when BASF planned to build a nuclear power station on its ground at Ludwigshafen, to supply process steam. Eventually the project was withdrawn by BASF. In the early 1970s, large public demonstrations prevented the construction of a nuclear plant at Wyhl. The Wyhl protests were an example of a local community challenging the nuclear industry through a strategy of direct action and civil disobedience. Police were accused of using unnecessarily violent means. Anti-nuclear success at Wyhl inspired nuclear opposition throughout Germany and elsewhere. The Rheinsberg Nuclear Power Plant was the first (mostly experimental) nuclear power plant in East Germany. It was of low power and operated from 1966 until 1990. The second to be commissioned, the Greifswald Nuclear Power Plant, was planned to house eight of the Russian 440 MW VVER-440 reactors. The first four went online between 1973 and 1979. Greifswald 5 operated for less than a month before it was closed, the other three were cancelled during different stages of their build-up. In 1990, during the German reunification, all nuclear power plants were closed due to the differences in safety standards. The Stendal Nuclear Power Plant in East Germany, was to be the largest nuclear power station in Germany. After German reunification, and due to concerns about the Soviet design, construction was stopped and the power station was never completed. In the 1990s the three cooling towers which had been erected were demolished, and the area is an industrial estate today. In September 2011, Siemens, which had been responsible for constructing all 17 of Germany's existing nuclear power plants, announced that it would exit the nuclear sector following the Fukushima disaster and the subsequent changes to German energy policy. It will no longer build nuclear power plants anywhere in the world. The company’s chairman, Peter Löscher, said that "Siemens was ending plans to cooperate with Rosatom, the Russian state-controlled nuclear power company, in the construction of dozens of nuclear plants throughout Russia over the coming two decades". Peter Löscher has supported the German government's planned energy transition to renewable energy technologies, calling it a "project of the century" and saying Berlin's target of reaching 35% renewable energy sources by 2020 was feasible. An October 2016 story in the Süddeutsche Zeitung reports that Finnish operator TVO is calling on Siemens to take financial responsibility for the completion of Unit 3 of the Olkiluoto Nuclear Power Plant in Finland, because its project partner, the French Areva Group, is being broken up by the French government. Unit 3 has a history of delays and its future profitability is in doubt. During the chancellorship of Gerhard Schröder, the social democratic-green government had decreed Germany's final retreat from using nuclear power by 2022, but the phase-out plan was initially delayed in late 2010, when during chancellorship of center-right Angela Merkel the coalition conservative-liberal government decreed a 12-year delay of the schedule. This delay provoked protests, including a human chain of 50,000 from Stuttgart to the nearby nuclear plant in Neckarwestheim. Anti-nuclear demonstrations on 12 March attracted 100,000 across Germany. On 14 March 2011, in response to the renewed concern about the use of nuclear energy the Fukushima incident raised in the German public and in light of upcoming elections in three German states, Merkel declared a 3-month moratorium on the reactor lifespan extension passed in 2010. On 15 March, the German government announced that it would temporarily shut down 8 of its 17 reactors, i.e. all reactors that went online before 1981. Former proponents of nuclear energy such as Angela Merkel, Guido Westerwelle, and Stefan Mappus have changed their positions, yet 71% of the population believe that to be a tactical manoeuvre related to upcoming state elections. In the largest anti-nuclear demonstration ever held in Germany, some 250,000 people protested on 26 March under the slogan "heed Fukushima – shut off all nuclear plants". On 30 May 2011, the German government announced a plan to shut all nuclear reactors by 2022. Environment Minister Norbert Röttgen stated of the decision, "It's definite. The latest end for the last three nuclear power plants is 2022. There will be no clause for revision". Prior to the decision, Germany's renewable energy sector already provided 17% of Germany's electricity and employed about 370,000. The decision to phase-out nuclear power has been called the swiftest change of political course since unification. Only a year earlier Angela Merkel's government overturned a decade-old decision to close all nuclear plants by 2022. Physicist Amory Lovins has said: "Chancellor Merkel was so shocked by Fukushima that she turned Germany’s energy focus from nuclear (of which she closed 41% and will close the rest within a decade) to efficiency and renewables. That’s supported by three-fourths of Germans and opposed by no political party". Merkel stated that Germany "[does not] only want to renounce nuclear energy by 2022, we also want to reduce our CO2 emissions by 40 percent and double our share of renewable energies, from about 17 percent today to then 35 percent". The chancellor noted the "helplessness" of Japan to manage the Fukushima Daiichi nuclear disaster. Merkel asserted that Germany's energy policy would be safe, reliable, and independent from imports, with affordable prices for both consumers and industry. Increased investment in natural gas plants would provide a backup to ensure consistency for those times when the solar, wind and hydroelectric sources did not meet demand. At the time of the Japanese Fukushima disaster, Germany was getting just under a quarter of its electricity from nuclear power. After the Fukushima disaster, the following eight German nuclear power reactors were declared permanently shut down on 6 August 2011: Biblis A and B, Brunsbuettel, Isar 1, Kruemmel, Neckarwestheim 1, Philippsburg 1 and Unterweser. Some German manufacturers and energy companies have criticized the phase-out plans, warning that Germany could face blackouts. However, this did not happen. Germany remained a net exporter of about 7016180000000000000♠5 TWh of power in 2011 after exporting 7016637200000000000♠17.7 TWh in 2010, according to data published by the energy utility association "AG Energiebilanzen" in February 2012. Swedish Energy company Vattenfall went in front of the World Bank's International Centre for Settlement of Investment Disputes (ICSID) to seek compensation from the German government for the premature shut-down of its nuclear plants. On 5 December 2016, the Federal Constitutional Court (Bundesverfassungsgericht) ruled that the nuclear plant operators affected by the accelerated phase-out of nuclear power following the Fukushima disaster are eligible for "adequate" compensation. The court found that the nuclear exit was essentially constitutional but that the utilities are entitled to damages for the "good faith" investments they made in 2010. The utilities can now sue the German government under civil law. E.ON, RWE, and Vattenfall are expected to seek a total of €19 billion under separate suits. Six cases were registered with courts in Germany, as of 7 December 2016. On 19 October 2016, the German cabinet (Bundeskabinett) finalized a deal with nuclear power plant operators E.ON, EnBW, RWE, and Vattenfall over long-term nuclear waste disposal. Under the agreement, the four operators are freed of responsibility for storing radioactive waste – that responsibility is instead transferred to the state. In return, the operators will pay a total of €17.4 billion into a state-administered fund to finance the interim and final storage of nuclear waste. They will also pay an additional "risk surcharge" of €6.2 billion (35.5%) to cover the eventuality that costs exceed current projections and that the interest accrued by the fund is lower than expected. The operators will be responsible for decommissioning and deconstructing their own nuclear power plants, as well as preparing their radioactive waste for final storage. Critics, including the German Renewable Energy Federation and BUND, claim the total of €23.6 billion would prove insufficient and that future taxpayers will carry the risk. The draft law is available in German. It is due to be enacted in early-2017. Since nuclear power generated almost a third of the electricity in Germany, many thought that the country would have to import energy as the nuclear phase-out progressed. At first, Germany was still selling more electricity than it bought, due to its renewable energy industry. Renewable energy supplied a record 20.8% of Germany’s electricity in the first half of 2011, from wind power, solar power, biomass and hydro. Germany installed over 7,400 MW of solar in 2010 and another 7,000 MW will be added in 2011. Solar and wind capacity is expected to grow by 32% from 2012–2013. The surge in renewable energy is credited with driving down the price of electricity in Germany. Germany has combined the phase-out with an initiative for renewable energy and wants to increase the efficiency of fossil power plants in an effort to reduce the reliance on coal. According to the former German Minister for the Environment Jürgen Trittin, in 2020, this would cut carbon dioxide emissions by 40 percent compared with 1990 levels. Germany has become one of the leaders in the efforts to fulfill the Kyoto protocol. Critics of the German policy have called it a mistake to abandon nuclear power, claiming the only alternative to nuclear power was coal and abandoning nuclear power was therefore contradictory to the goal of lowering CO2 emissions. As a result of its efforts and subsidies, Germany has developed advanced non-conventional renewable energy for electricity generation, particularly in photovoltaic and wind turbine installations. At the same time, Germany continues to rely heavily on coal power, with usage increasing to offset the phase-out of nuclear energy. The German nuclear industry has insisted that its shutdown would cause major damage to the country's industrial base. In 2012, member firms of the Verband der Industriellen Energie- und Kraftwirtschaft (VIK) reported power failures of several seconds duration, combined with a rise in frequency fluctuations. These were reportedly caused by network overloads due to the shutdown of nuclear power plants, and an increase in wind power generation. VIK also fear that industrial control units will be damaged by outages. The cost of replacing Germany's nuclear power generation with renewable energy has been officially estimated by the German Ministry of Economics at about €0.01/kWh (about €55 billion for the next decade), on top of the €13 billion per year already devoted to subsidizing renewables. However, unofficial estimates of the ministry, and of the Rhenish-Westphalian Institute for Economic Research (RWI), German Energy Agency (DENA), Federation of German Consumer Organizations (VZBV), and the government-owned development bank (KfW), put the cost several times higher, at about €250 billion ($340 B) over the next decade. In March 2013, the administrative court for the German state of Hesse ruled that a three-month closure imposed by the government on RWE's Biblis A and B reactors as an immediate response to Fukushima Daiichi accident was illegal. The state ministry of the environment acted illegally in March 2011, when an order was issued for the immediate closure of the Biblis units. RWE complied with the decree by shutting Biblis-A immediately, however as the plants were in compliance with the relevant safety requirements, the German government had no legal grounds for shutting them. The court ruled that the closure notice was illegal because RWE had not been given sufficient opportunity to respond to the order.